Omnia uses the finest quality materials. Each set come standard with a 28 degree latch and all concealed mounting screws. The stainless steel collection uses high quality 304 grade stainless steel for a lifetime of use. 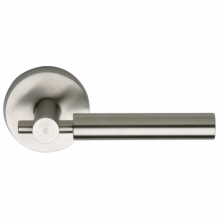 We offer the complete line of Omnia Hardware in brass or stainless. If you do not see it on our website, please call, fax or email the items you want and we will email you a detailed proposal at our discounted price for your approval. Omnia will drop ship direct from the manufacturer in about 7 to 10 days lead times if in stock. Please call, email or send us a fax with the items you want and we will send you a detailed proposal at our super discount pricing for your approval . You may also visit the Omnia Hardware manufacturer website at OmniaIndustries.com for their complete line of Omnia Hardware. OmniaIndustries.com and Omnia Hardware at LOW DISCOUNT PRICES. Good door locks and passage door handles. If you need to know where to buy door lock passage door handles and handles for entrance door, Door Hardware USA.com is the place to go! OmniaIndustries.com is the Omnia Hardware manufacturers website offers quality solid brass and solid stainless steel locksets and accessory hardware. Omnia has special door locks and cool door locks in all types of styles and finishes all at Lowest Prices. Whether you need good door locks, passage door handles, entrance door handles, or even cheap door handles, Omnia makes exclusive door handles and door knobs with locks for almost any style at the Lowest Prices from Door Hardware USA. We are the company "where to buy door locks" and the place to buy door knobs and passage door handles. Omnia exclusive door handles and good door locks are cool door locks to be used for passage door handles and entrance door handles. They are not cheap door handles like the low quality brands, but have the highest quality entrance door lock and handles for entrance doors.